Does anyone know what brand this is? There was absolutely no English on the package and nothing turned up on Google. (Although I wasn't really sure what to search.) The only thing I do know is that this package contains different styles and flavors of chewing gum. Similar to Meiji's samplers, this set features adorable mascots and bright colors. The packaging was really childish and playful, so this would definitely appeal to kids, but to adult eyes it looks like some kind of knock-off. (It might be. I'm not sure.) The designs are cute but generic, like something you might find in a dollar store. Although the art itself is simple, there are little reminders to dispose of your trash and recycle the box, as well as little indicators of flavor. In short, this design looks kind of cheap but it touches on all the important points that packaging should. I decided to start with the grape. Judging by the box art, I am guessing that this will be normal grape flavored chewing gum. I opened the box and there were cute little purple spheres of gum inside, just as I suspected. At first glance they look a lot like Marukawa's grape bubble gum, but the coloring is slightly off. 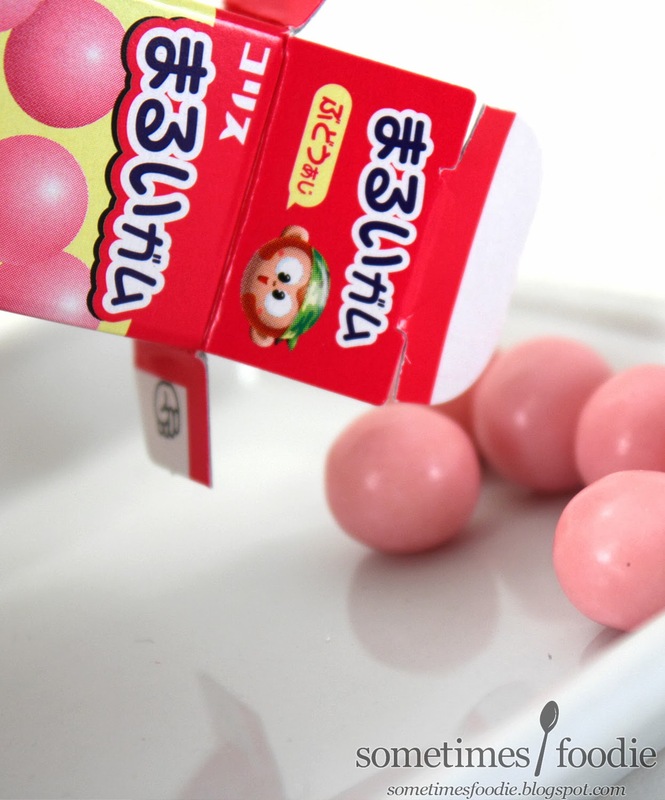 As far as taste, this gum has a slightly thicker shell than Marukawa, so there is initially a gritty sugary texture, but it quickly dissolves into a slightly artificial grape bubble gum. It's sweet, and pleasant, but Marukawa has a much more authentic flavor. 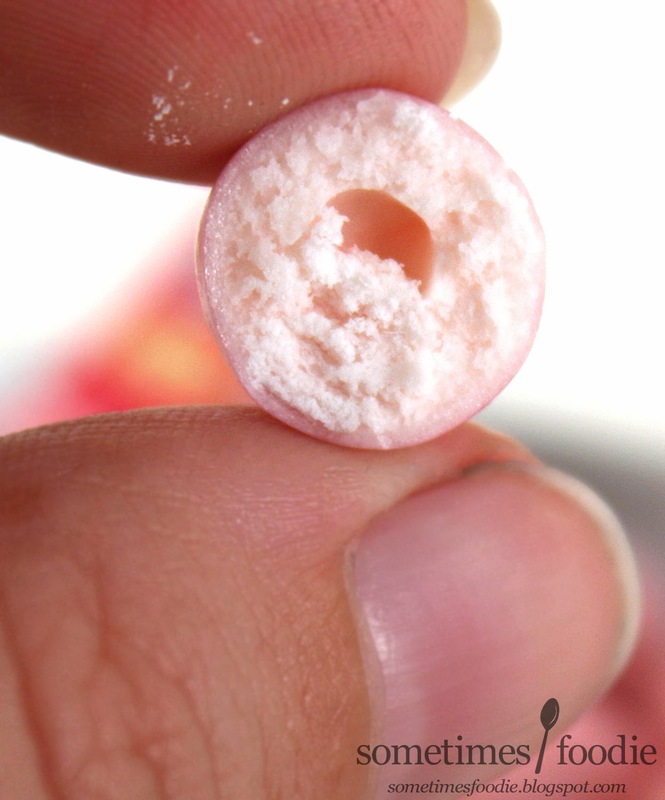 The gum had a smooth and soft chew, just like other Japanese chewing gums, but the flavor wasn't as authentic as candies I have reviewed in the past. 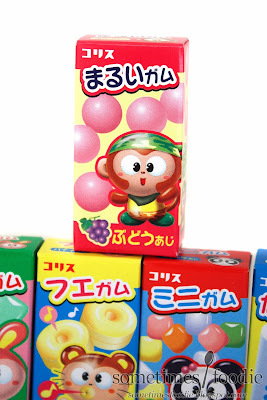 If you want an amazing grape bubble gum, I strongly suggest Marukawa's version.